It always fascinates me that whenever I meet someone new and I tell them that I practice hypnotherapy, they often seem to want to tell me one of two things: 1. that they can be easily hypnotized; 2. that there is no way they could ever be hypnotized. In general, people who are fascinated with the subject of hypnosis (but who have never experienced the process) seem to believe, or more likely want to believe, that they would easily fall into a trance induced by a hypnotist. There are several different psychological forces at work here. First, there is the tendency of some people to want to please someone like a therapist, perhaps because they see therapists as good, helping people who are due some respect. It is also a widely-reported fact among therapists that the number one thing a patient wants from a therapist is to be liked, thus they express a liking for what the hypnotist does. Then again, there are some who simply find the whole idea of hypnosis to be exciting and interesting, and those individuals want a hypnotist to know that they are definitely open to being hypnotized. Perhaps they are even hoping for a demonstration of hypnosis on the spot! The other group, however, is quick to proclaim that they could never fall into a hypnotic trance, for a variety of reasons. Again assuming they have never tried hypnosis before, some of these individuals claim they are too strong-willed to ever be taken in by such nonsense. Others say that they are too intelligent to be hypnotized, implying that only a mind-numbed moron would allow himself or herself to be “taken over” by someone else’s ministrations. Of course, some individuals are convinced that hypnosis has no basis in science and has no real effects; that it is a bogus undertaking, and thus any efforts by a hypnotherapist would be ineffective in their case. Still others cite their own inability to relax, or to pay attention to anything for more than a few minutes. Having hypnotized literally hundreds of people over the years, I also find that there are those who hint–or outright state–that they don’t want anyone mucking about in their minds and possibly unearthing secrets known only to them. It is important to note here that these individuals are not expressing a disbelief in the effectiveness of hypnosis on them or anyone else. On the contrary, they seem to be saying that hypnosis may be far too effective on them, and that the results could be embarrassing for them! Rather than openly expressing such a fear or subjecting themselves to what they view as shame or embarrassment, some will simply insist that they cannot be hypnotized for other reasons, including those mentioned above. Then again, there are times when hypnotherapy patients will turn out to be mistaken in their expressions about how easily they can be hypnotized. 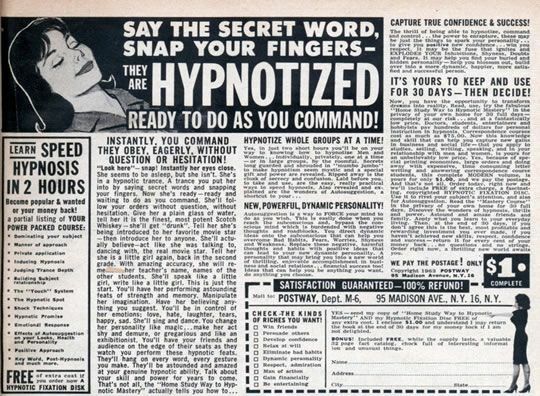 I have personally seen cases where individuals will express great enthusiasm for hypnosis and its possible benefits, but will later say they found it difficult or impossible to “go into a trance.” In subsequent interviews, some such patients have revealed previously unspoken reasons for not wanting to be hypnotized (“My husband thinks it is hogwash and may be the work of the devil!”) or for not wanting the hypnosis to work (“If I lose weight, it will hurt my overweight wife’s feelings.”}. On the other side of that coin, I have also seen cases where individuals who disbelieve in the validity of hypnosis and/or their likelihood of being hypnotized will cooperate fully with the process and do beautifully in resolving a presenting issue. Sometimes these people do not even realize that a change has occurred until the hypnotist points out that 40 minutes has passed on the clock, or until someone else notices a marked change in their behavior. Such individuals are often pleasantly surprised. While they may not have wanted to be hypnotized, they were apparently holding on to the slim chance that it might actually help them. And this brings us to an answer to the question posed in the headline of this essay: “Who Can be Hypnotized?” The obvious answer is that anyone who wants to be hypnotized–either consciously or unconsciously–can be hypnotized and can derive great benefit from the hypnotherapy process. What this means is that the patient must be completely honest with himself or herself about whether this process is something in which they desire to participate. For this reason, a skilled hypnotherapist will do a thorough screening to reveal any negatives that could compromise the effectiveness of the hypnotherapy session. As an addendum, let me note that some studies have purported to show what percentage of the population in general is “suggestible” enough to be hypnotized. Such studies, however, rarely take into account the psychological issues mentioned above. Further, as practitioners have learned in clinical practice, suggestibility is not the key issue. Rather it is the level of desire to solve a problem and to allow the hypnotherapy process to work that will ultimately decide who can be hypnotized and how effective that hypnosis will be.